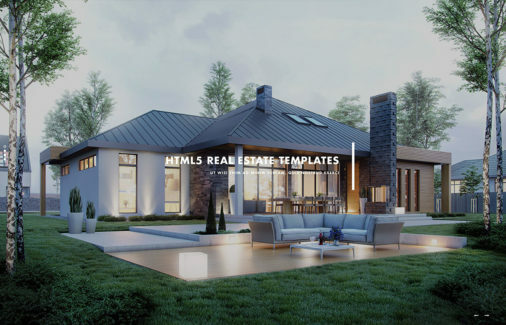 HTML tables are not necessarily something that everyone will be using on their websites, however they are incredibly helpful when it comes to presenting data through rows and columns, and also for organizing data and information in a more accessible way. To get started with creating a table is very easy, the function relies purely on the ‘table’ element we find in traditional HTML standard, but by default, the basic HTML tables can have somewhat of a bleak feel to them, which is where we need to direct our attention to CSS3 — as it enables us to better style our tables, and perhaps even extend them with interactive features. With CSS3, we can quickly change the appearance of our tables in the form of colors, background colors, border colors, and even play with width and height specifications — all by using our external stylesheet file. 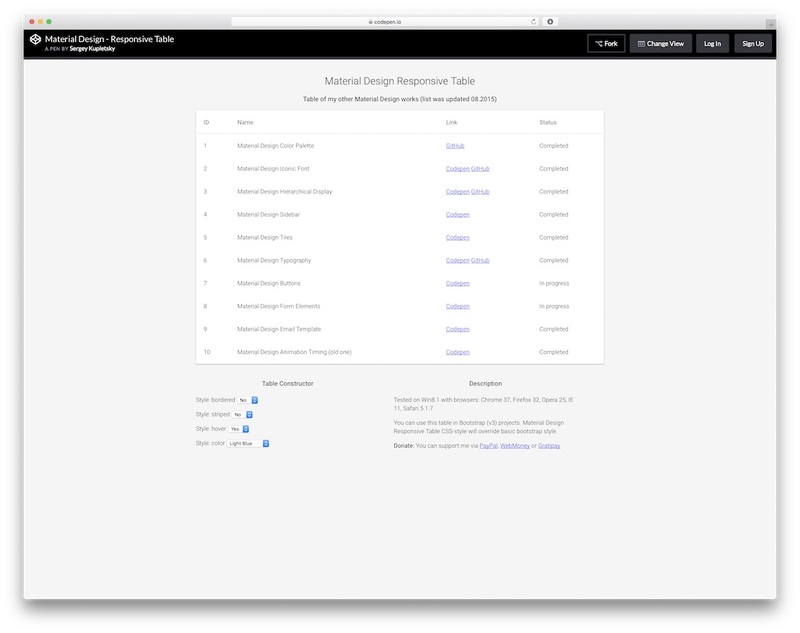 And to help you to speed up the process, we spent some time gathering together a number of CSS3 optimized table templates to give you a perspective on what other designers are doing in the current state of web design, and how you can quickly apply those same concepts to your tables. All the snippets are available for free, which means you can edit and customize them as you like, then use on your own projects. There are no limitations. 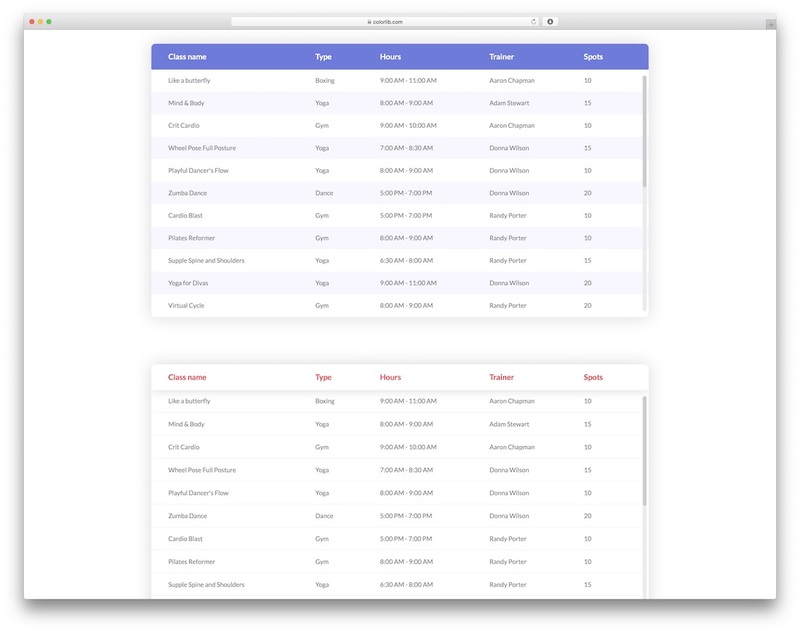 We didn’t like any of free HTML/CSS table template option that were available and we decides to create several table examples ourselves. Here is the first one in the list with a fixed column and horizontal scroll. These table variations are also created by Colorlib and in this case we have added fixed top row for each table that remain in place on scroll. You can further tweak this idea to get the results you were looking for. 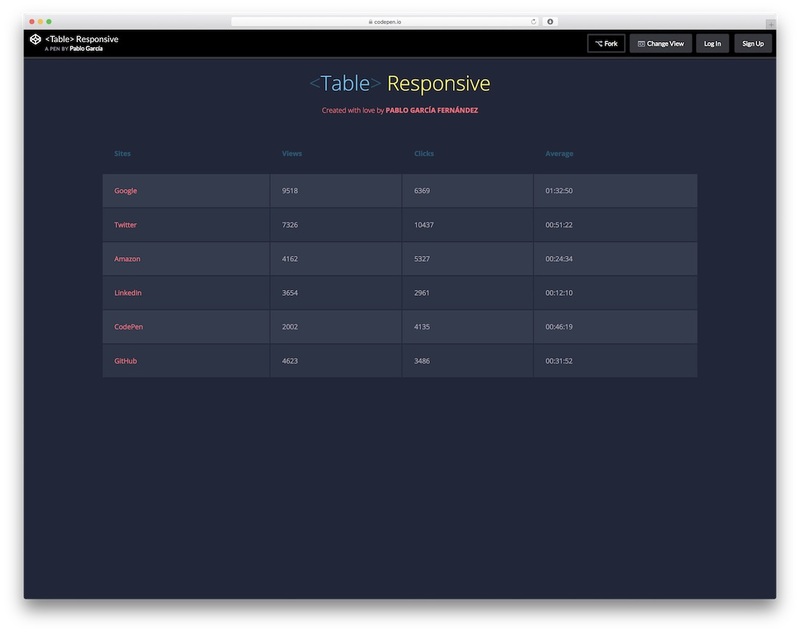 These HTML5 & CSS3 tables comes with highlights for both vertical and horizontal rows. We made sure to have several different variations, so you can choose the one that works the best for you. Responsive tables has always been a huge problem because you can resize them to a certain point to still make them useful. 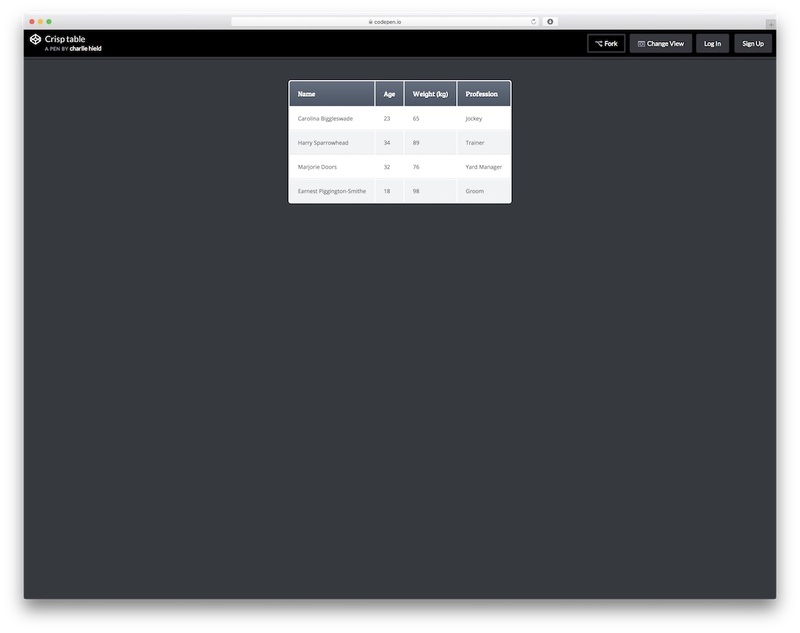 Not anymore as these HTML/CSS tables will work well on any mobile devices. 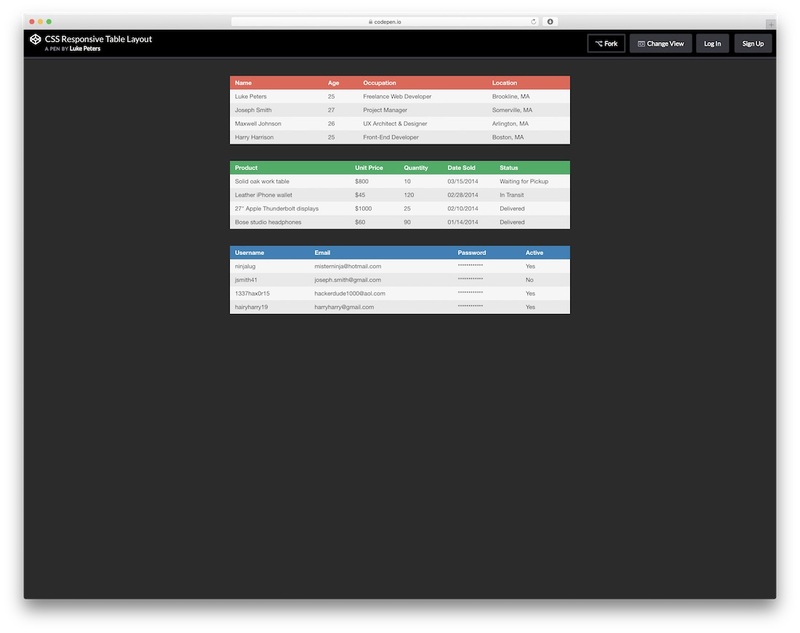 This is a similar HTML/CSS table template as the previous one because it also features a responsive layout. 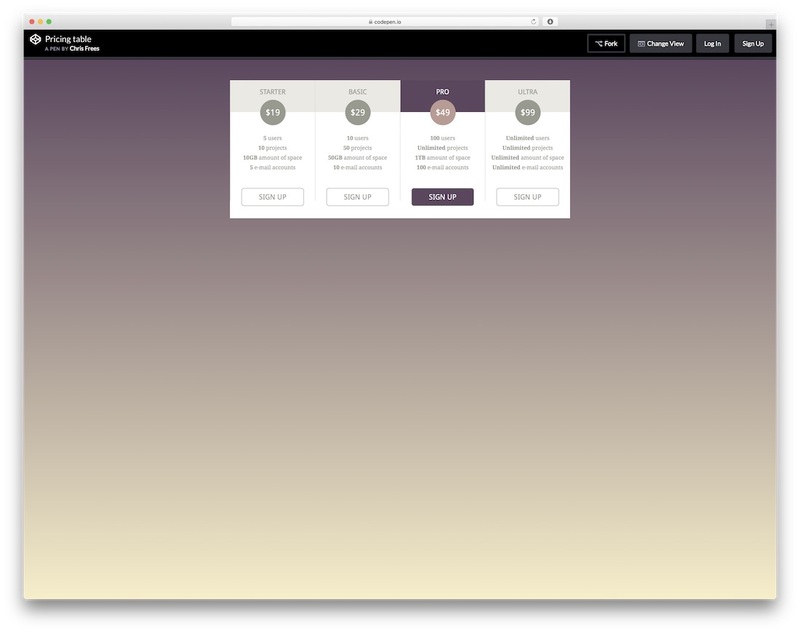 Bootstrap is the most famous front-end development framework on the planet, it’s being used everywhere; well, almost! 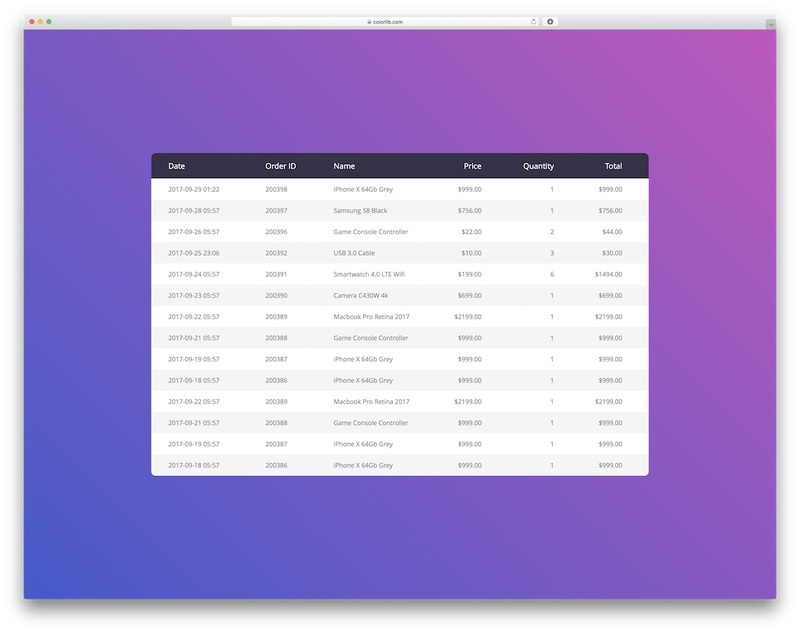 Bootstrap helps front-end devs to rapidly build websites without having to invest much thought into the process of making something look pretty, as every element is already pre-determined, and all you have to do is allocate the positioning, and maybe change the colors up a little. Native HTML5 unfortunately aren’t responsive to the browser, however with a few tiny CSS3 modifications the prefered result can be achieved. 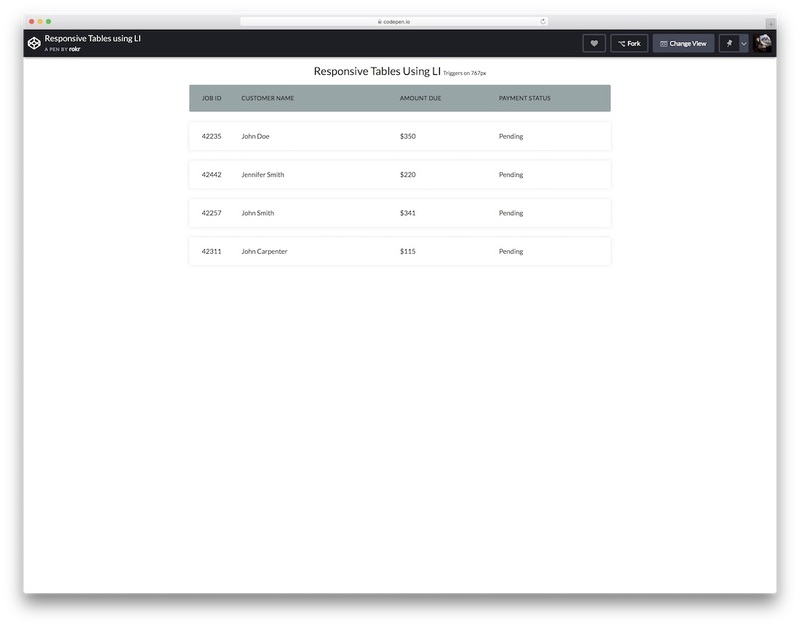 Responstable from Jordy van Raaij is a very elegant solution for those who need nothing but a responsive table template for the use in apps and websites. With a few dynamic modifications, you can incorporate a form submission for this table to submit selected table rows. Responsive Table from Geoff Yuen is a modernly styled table solution that will look great on websites that want to achieve that futuristic look. Geoff Yuen is using an approach of limited borders to help you integrate this table template within designs that are fluid by nature. Colors are dark, but you can adjust colors to your own needs with just a few minor changes. 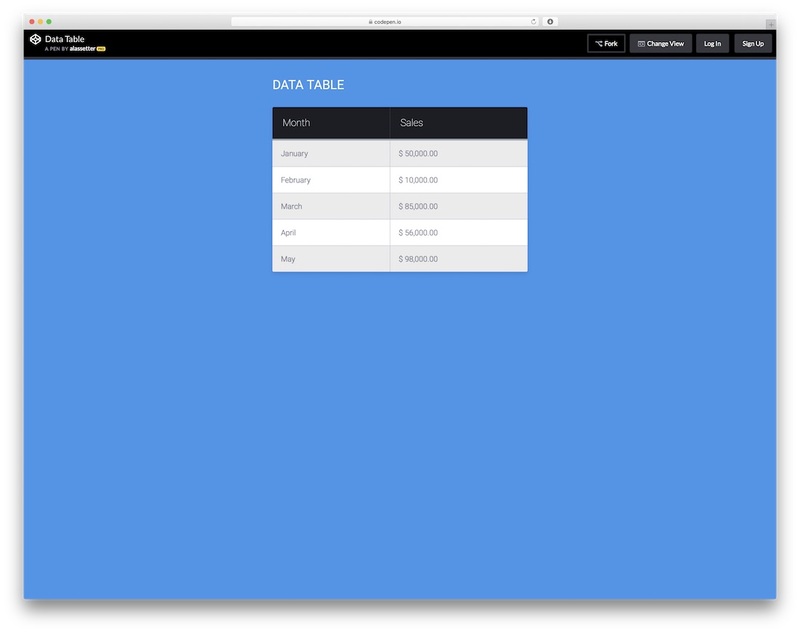 Sergey Kupletsky is giving out to the world a CSS3 responsive table template that’s based on material design patterns. This template also features a table constructor which you can use to quickly change colors, add borders, integrate a striped effect for the table list items, and also enable or disable a hover effect which will highlight the item that the user is currently viewing within the table. Works well with Bootstrap. jQuery and HTML5 add so much to the modern development experience, and this HTML5 Editable Table template from Ash Blue is the perfect example for it. 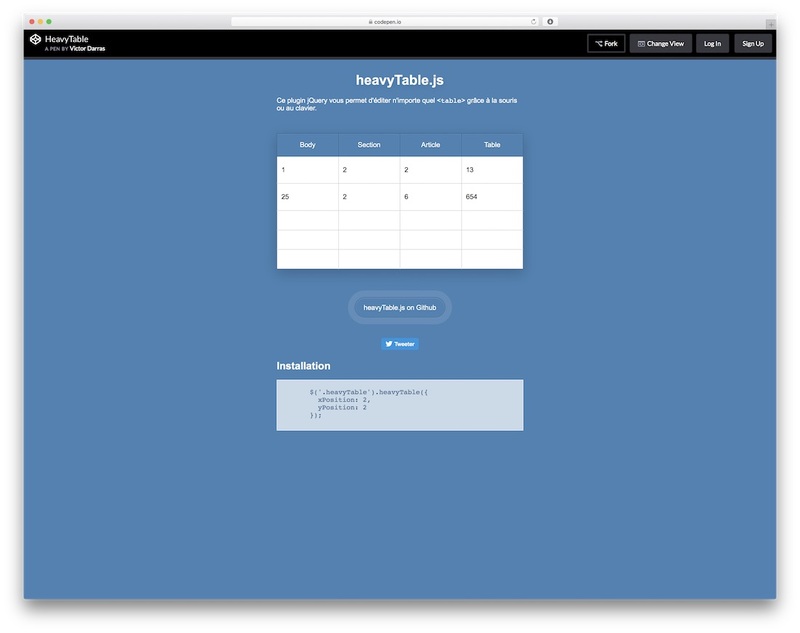 This jQuery amplified template will let you add and remove table items directly from the browser, but also let you edit each specified list item as you require. You can even move the items up and down, very convenient to integrate in projects that require such functionality. In this collection, we bring you loads of different CSS table templates which you can download free of charge. Regardless of your purpose, there is a tool for you. 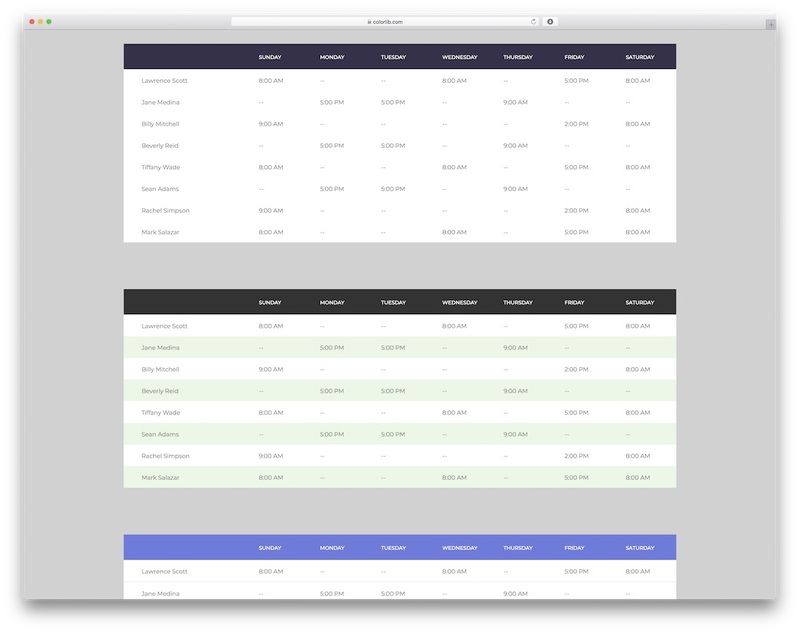 If you are tracking sales, affiliate payments and other whatnots, this responsive table using LI is one to consider using. You can put it into play right away and see how it performs for you. Besides, you can add IDs, customer name, amount and payment status, but, of course, you do not need to follow default settings to a T. You can quickly and effortlessly update the look of the table and match it to your branding style precisely. If you are a freelancer, an agency, a software company or even a web hosting firm, chances are, you want to add pricing tables to your website. 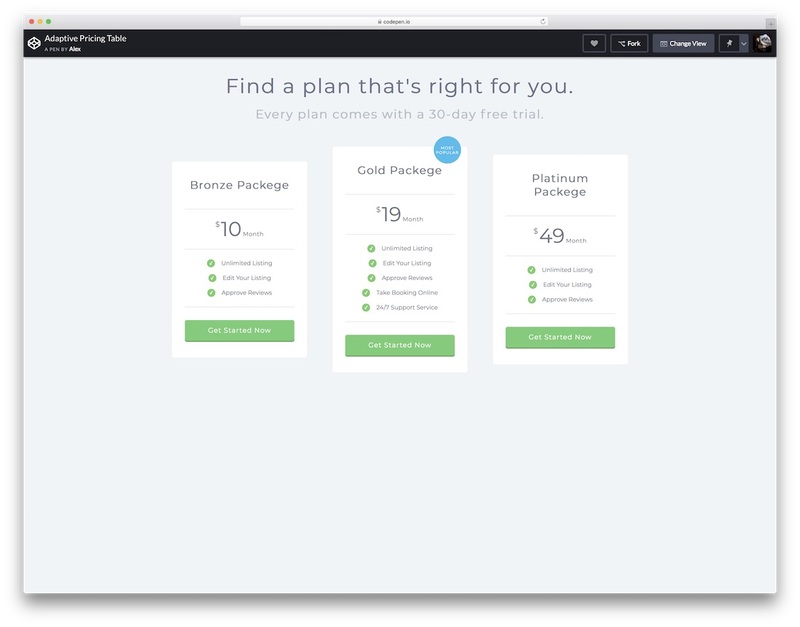 To get things rolling, here is a modern, clean and easy to use free CSS3 pricing plans table. 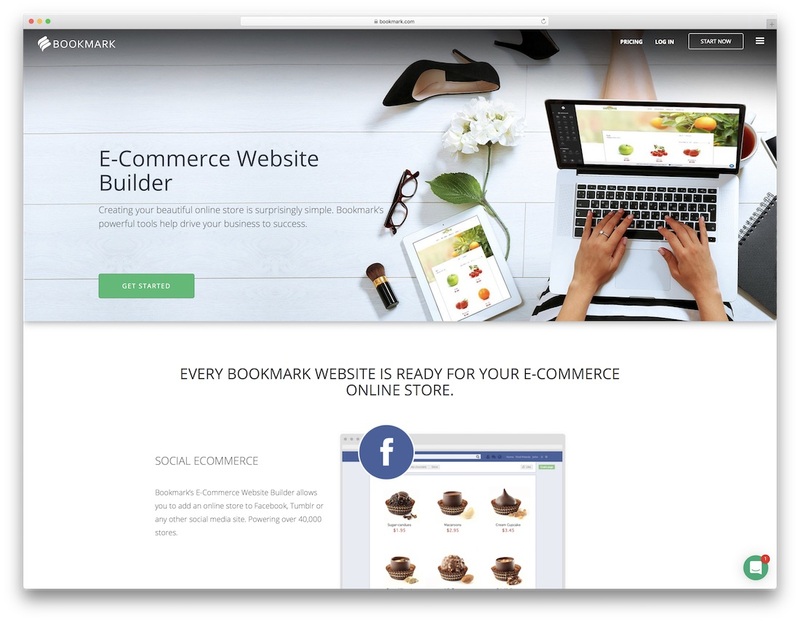 Play around with its features and create an outcome that fits your website ideally. Meaning, change texts, colors and improve it accordingly. However, even if using it as is and changing details only, you are ready and set to keep things of the professional level with your online presence. Push your packages and let everyone know what they can expect after they take the plunge. Tables aren’t just for data, not always. Sometimes we need table solutions for things like displaying pricing. This CSS3 Pricing Table template from Allen Zapien is a great example of how CSS3 can be used to display variety of content in many beautiful ways. 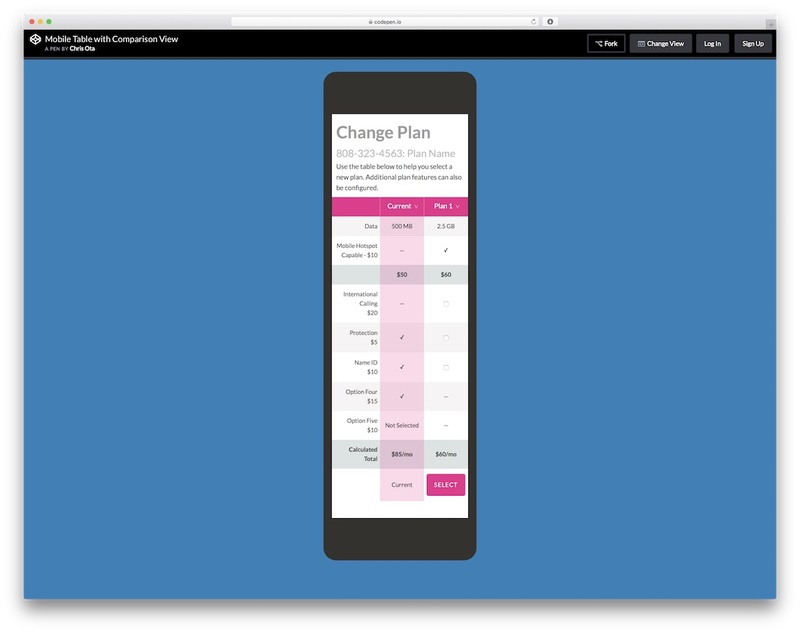 You can outline the most successful pricing module with an in-built outline template, and of course, you can quickly make any changes to make the table more suitable for your design. Ellen Lassetter is offering to the community a simple to use Data Table that’s fully responsive. 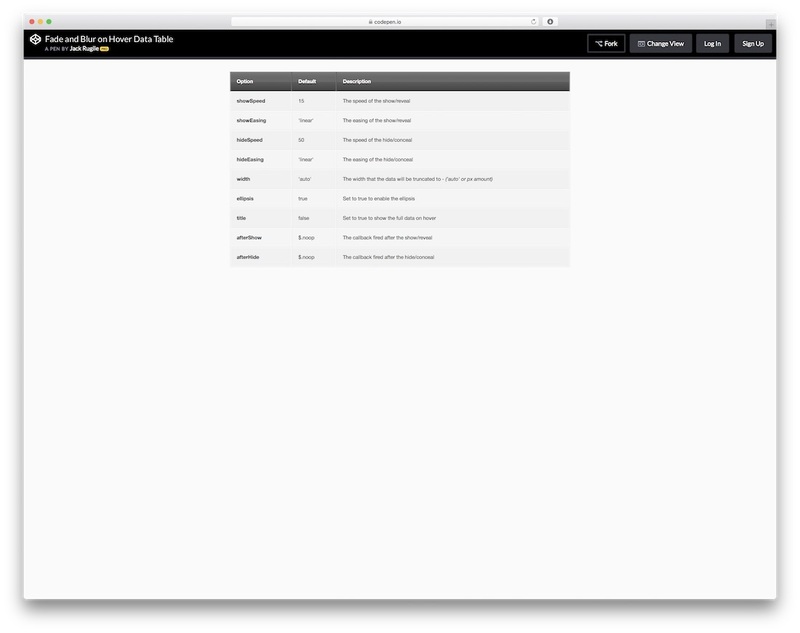 Has a hover over effect for highlighting the items that you are browsing on the list. Nothing too fancy, but simplicity usually goes a long way. CSS Table Layout (or should we say layouts) by Luke Peters simple CSS3 based tables that come in three different colors; red, green and blue. Each table features a variation of rows, but ultimately it comes down to yourself and what kind of data you want to display with your tables, this is just a template that you can use to make it all happen and to enable mobile access to these tables. 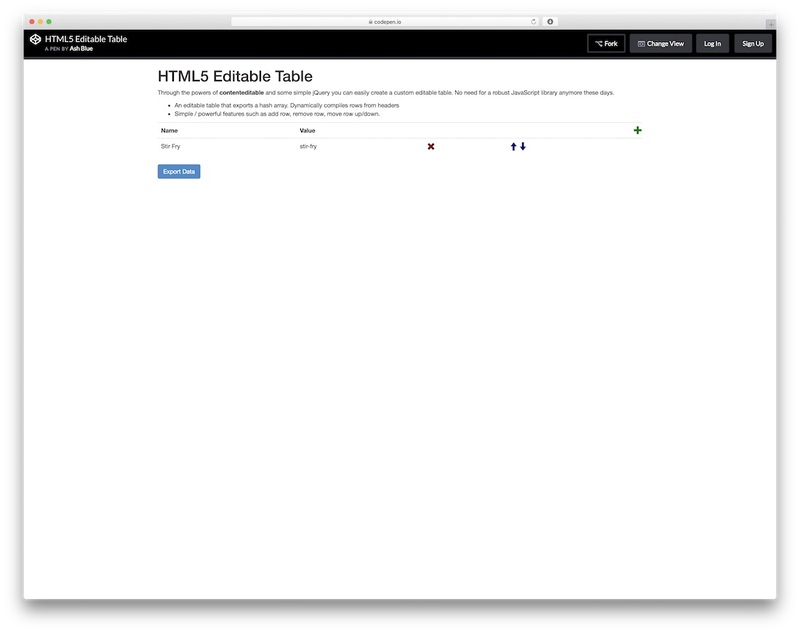 Anthony Collurafici has built a responsive HTML table with pure CSS3 and nothing else. It’s lightweight, it’s reliable and it’s compliant with your favorite devices and browsers, nothing else to say about this one. We have two more CSS3 pricing table templates coming up, so here is the first one from Chris Frees — with a modern feel and look, this Pricing Table template will fit well between modern and Bootstrap optimized designs, and for those situations where you wish for the pricing module to really stand out from the rest. You can quickly set a leading pricing plan by setting a background color for any of the available plans, but of course, you can also easily edit the pricing template to add more pricing options, or in fact remove them. You may have heard of this dude before, Jake Rocheleau — a writer and passionate designer who has been sharing his work with the community for quite some while now. 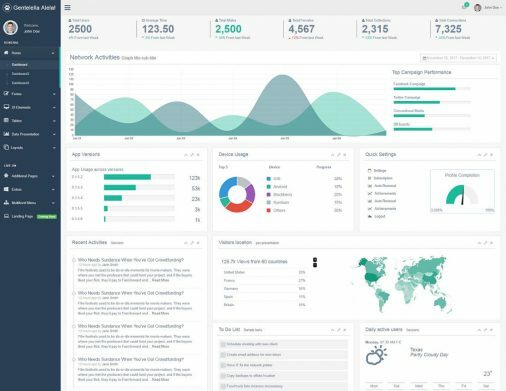 Jake Rocheleau also sometimes shares his own-built work with the community, and one of his latest and most successful creations has been the Sortable Tabular Data table template. Basically this is a table optimized with some jQuery to help you quickly sort and align your data based on ascending and descending information, be it letters or numbers. Cool to use when you are working with a data library, and need a quick way to sort the data within the browser. Pricing tables, data tables, dynamic tables, there are so many ways to use tables, and one more to add to the list is the following template — a table data template for displaying nutrition facts for literally any food item out there. Of course, adding each of the facts standalone could take up some time, even just to report all the existing fruit there is, so we highly recommend to take this template and integrate it within your existing platform that requires to output nutritional information for produce, and then filter all your data through this template to provide a remarkable experience for anyone looking it up. 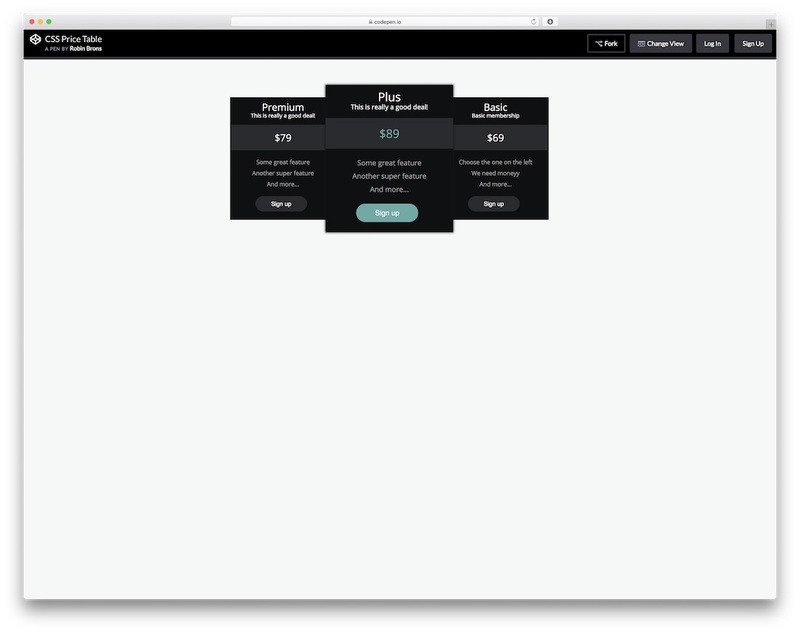 The last CSS3 pricing table template in this post is utilizing dark design aspects (which you can change), and a more direct way of outlining the leading pricing plan. 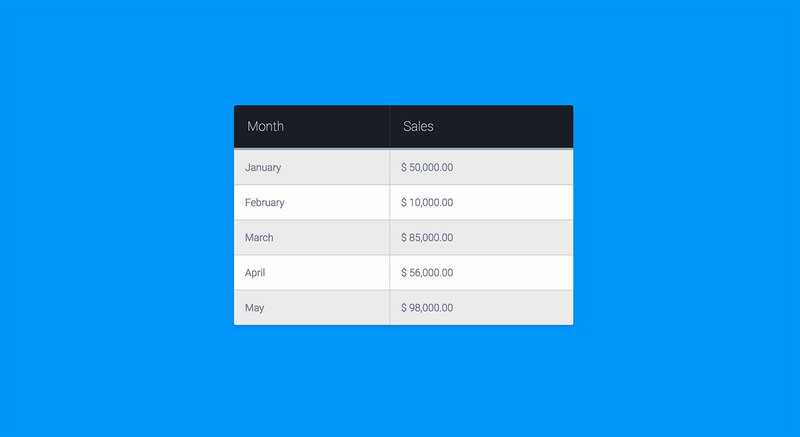 Robin Brons has ensured that his price table template is going to be responsive on all devices, so enjoy it at your will. We saw material design, but other design types are still falling behind it seems, except for Flat — Leonardo do Espírito Santo is sharing with his fellow community members a minimalistic table template based on Flat design. He also has happened to add two icons to the tables; Edit and Delete, but these will require some additional jQuery coding in order to make them work, nice to have though! Nikhil Krishnan taps into the creative part of the braina and brings out this fixed table header template, which as you can imagine is a traditional responsive table template, just optimized to have a fixed header. Fixed headers help in situations where there is a ton of data to skim through, and it’s best if the user is able to recall each row as it is, rather than having to scroll up and down mindlessly. Tables have many purposes, one of them is to serve data in a hardened way. Calendars are much like tables. You can customize them to display different information for each row (date). 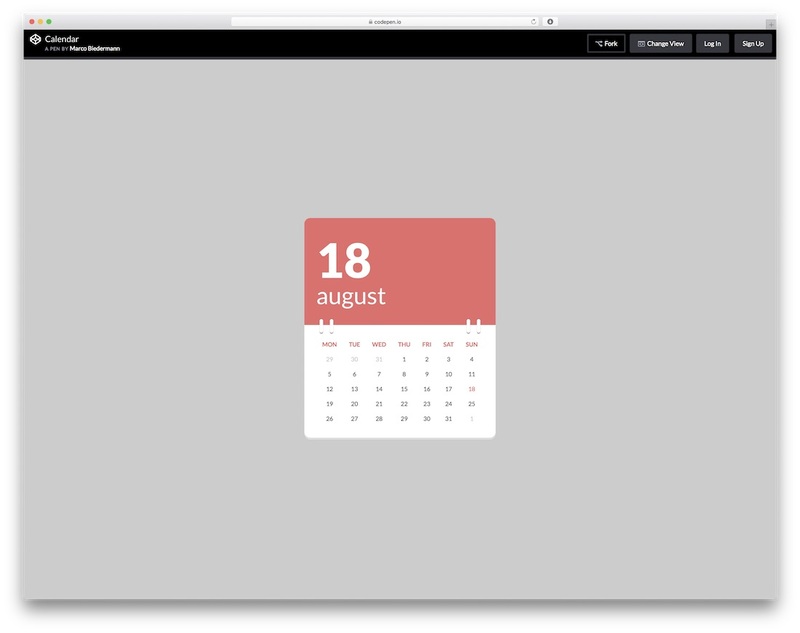 We felt it’s necessary to include this amazing CSS3 Calendar template from Marco Biedermann. This template is based on the approach that all tables take as well. Charlie Hield is just sharing work from a profession he is so passionate about. 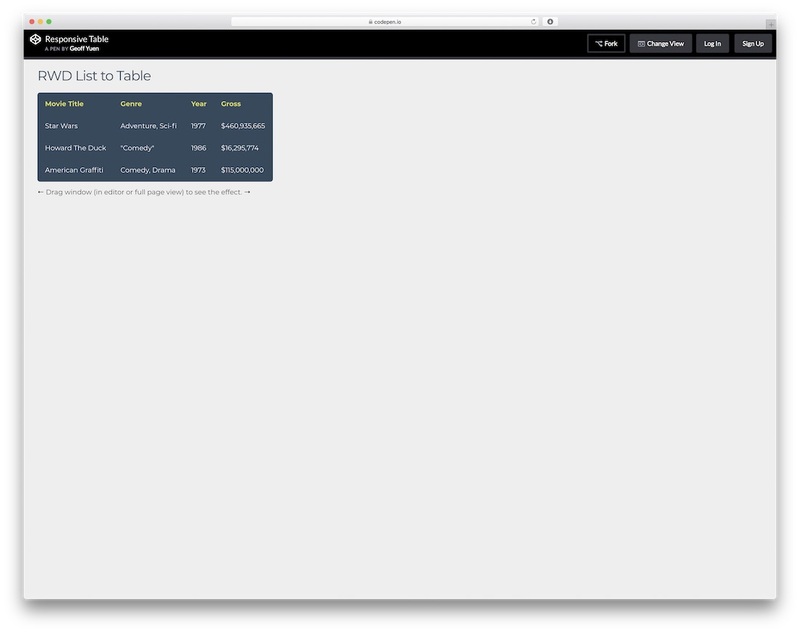 Crisp Table is an alternative solution for a CSS3 table for anyone who desires it. Perhaps, you just want to save some time by not having to style your design to look as crisp as this one does. 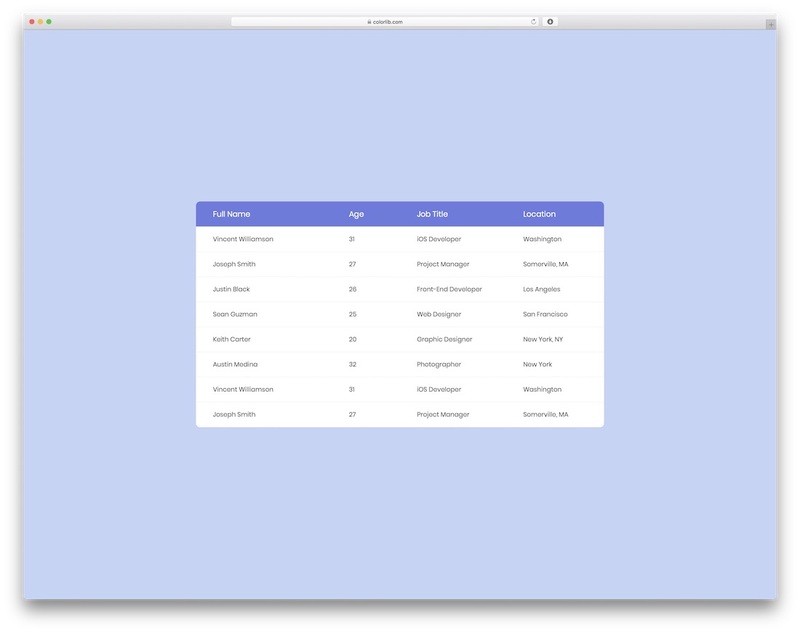 “Table” Responsive from Pablo García Fernández is a stunning execution of what the modern CSS3 standard (and also HTML5) is able to bring to the table. 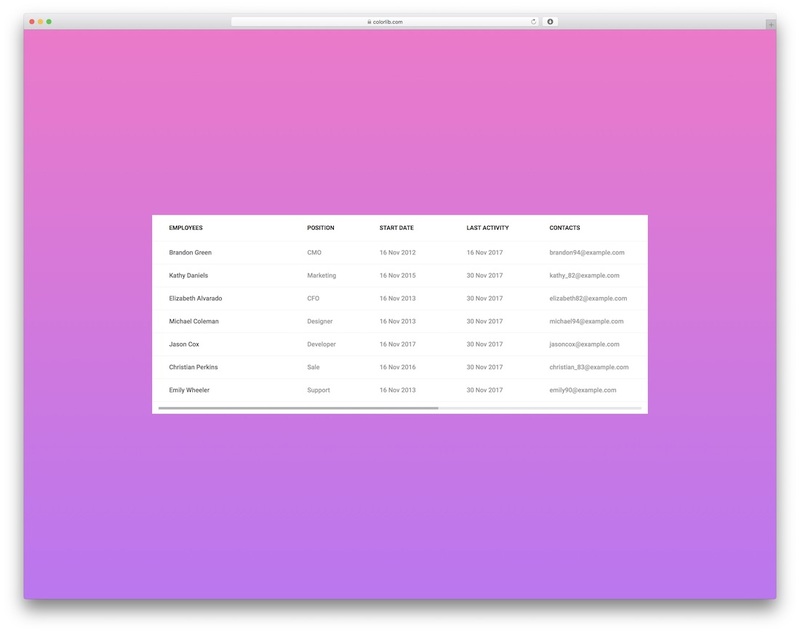 Here’s a borderless table template that features 3D highlight effect for each of the row items. Although the theme is somewhat dark, we recommend you play with the styling and find a fit that will work for your designs. We admire people like Chris Ota who take their time to really make something into something special, and Mobile Table with Comparison View is just that; a special piece of design work that’s built for mobile devices that require input table data for pricing modules, or for general submission forms. Pure is a framework library. By adding Pure to your website or project, you are entitled to use more than 10 different elements. This will make web development much quicker, and much more of an enjoyable experience. Pure focuses on helping developers to rapidly build elements without having to worry about styling them. Additionally, the table element is one of the ways that they offer. Get started with Pure now, you won’t regret it! To be able to fully comprehend things, it’s a wise idea to read the actual documentation on something. In this case, you should read the table module / element. 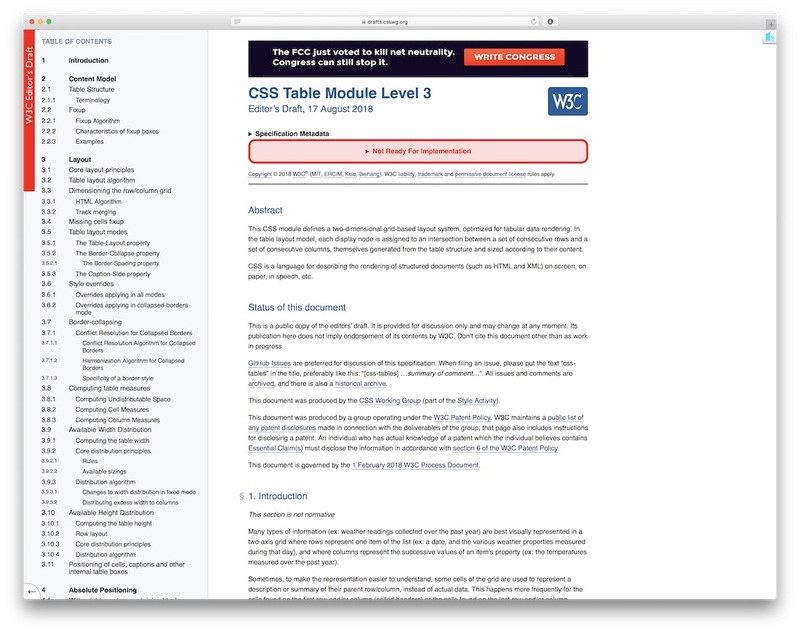 We recommend this excerpt from the official CSS3 standard to learn more about tables, and table modules. 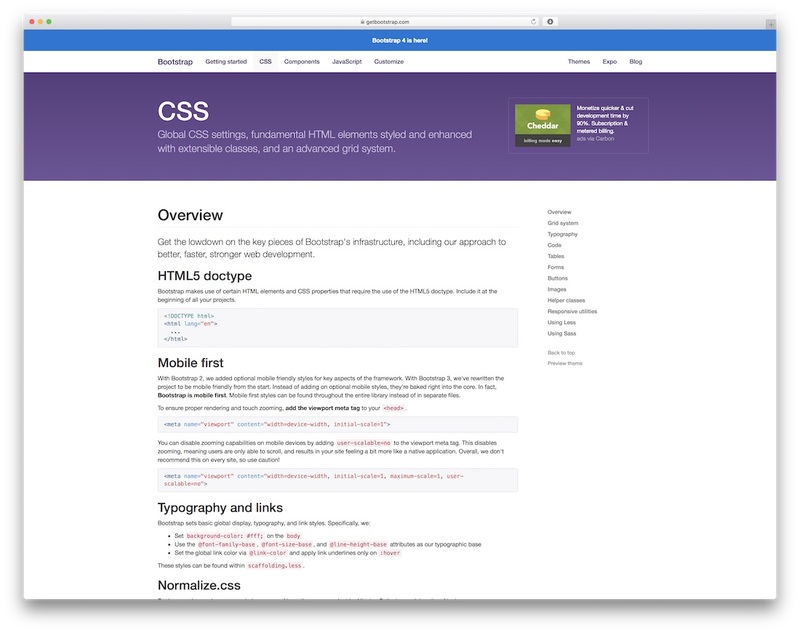 You should also learn more on how they interact with CSS3. 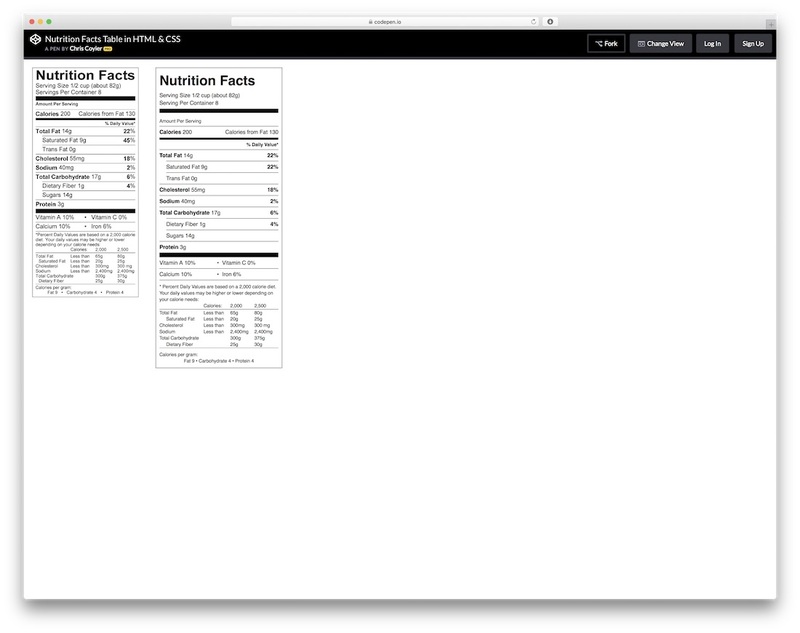 You also need to know the actual limitations of this template as far as web development goes. 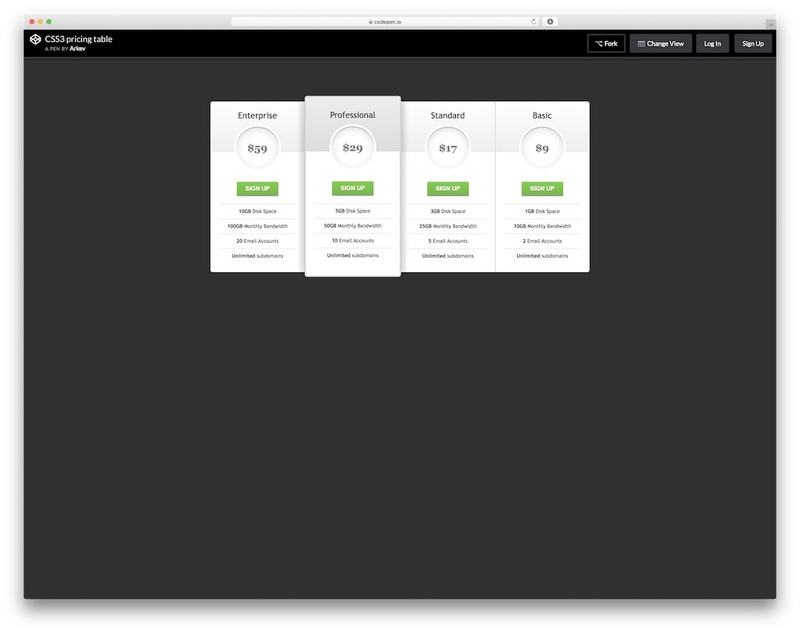 I’d love to recommend you the pricing table plugin I’m using for my website. I love these tables, simple yet elegant~! Can someone explain to me how the third table getting blured? Which one did you mean by third? 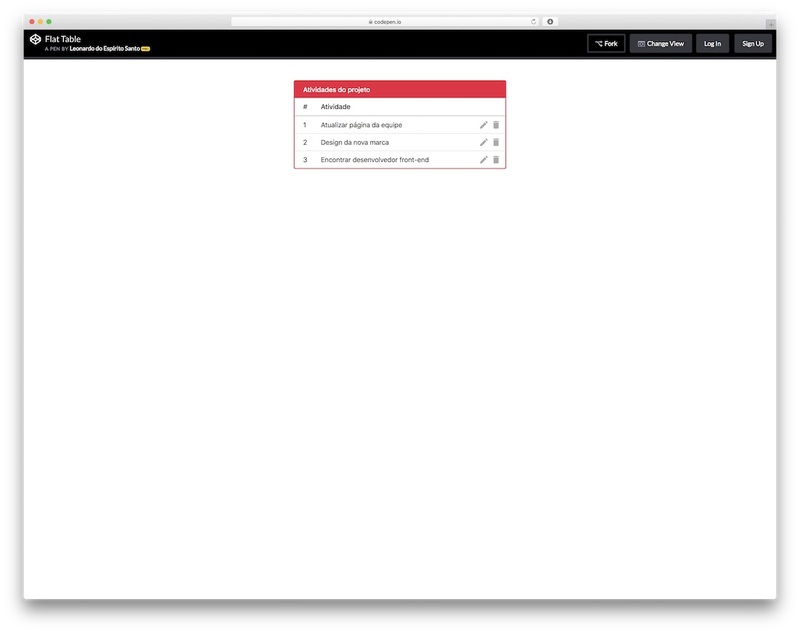 Yeah… If you want your table to look the same as any other Bootstrapped website. NOT!!! Thanks a lot. However I may need a bit more help. I used one of the tables via wordpress. I pasted the html codes into the page text-editor. Also I pasted the css codes to the style.css file. But the table does not seem to have style effects. Only a raw table. What did I do wrong? Ok, after some time it was fixed, now it works proplerly, thanks again. 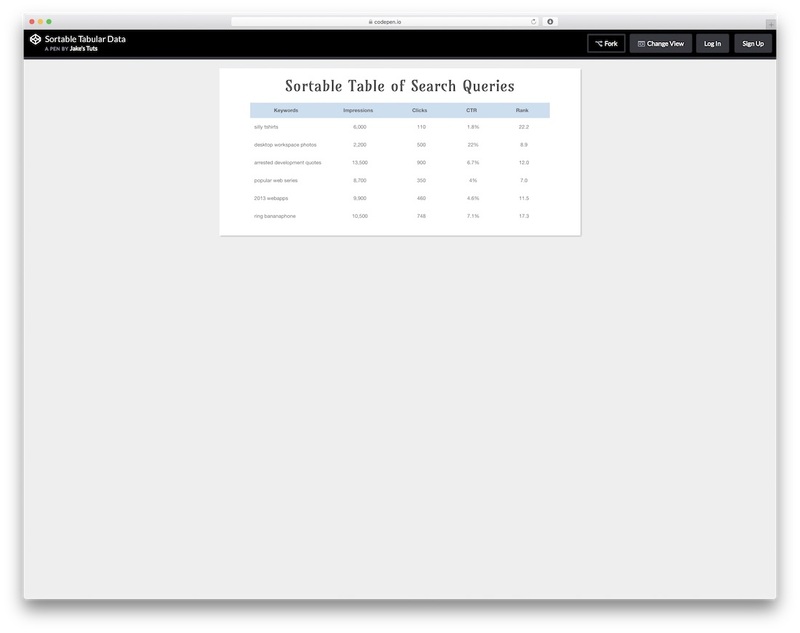 Very nice Tables… We find this one “Fade and Blur on Hover Data Table” is very perfect for public Stampdata. Thanks a lot, I was looked for these temples, really helpful for me.these templets save my time. Very nice and basic example which can be easily incorporated into existing code. Many Thanks!! Simple tables yet gives a catch for the eyes of the visitors. Your examples are great. 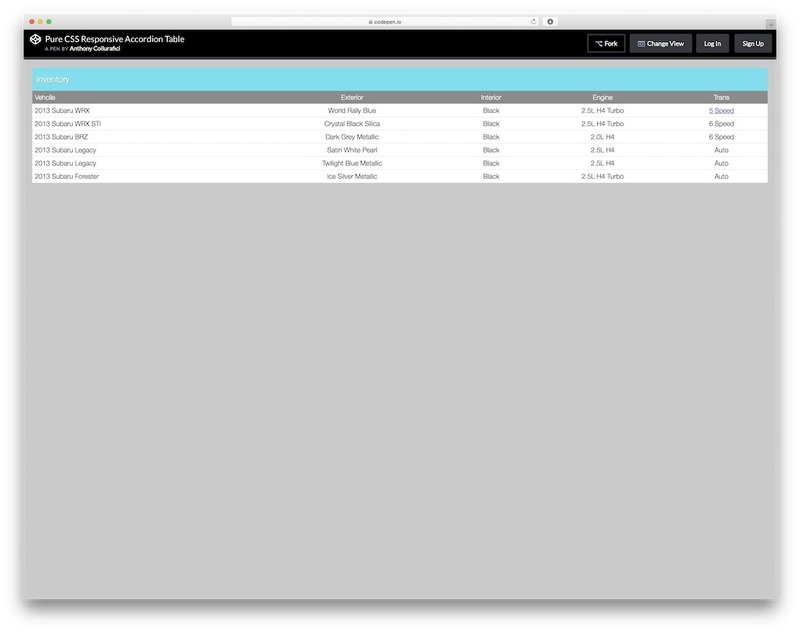 Thanks for bringing this into your article..
“Fixed Header Table by Colorlib” is not responsive. It wasn’t supposed to be responsive. Combining responsiveness while having a fixed header layout is a very difficult challenge. 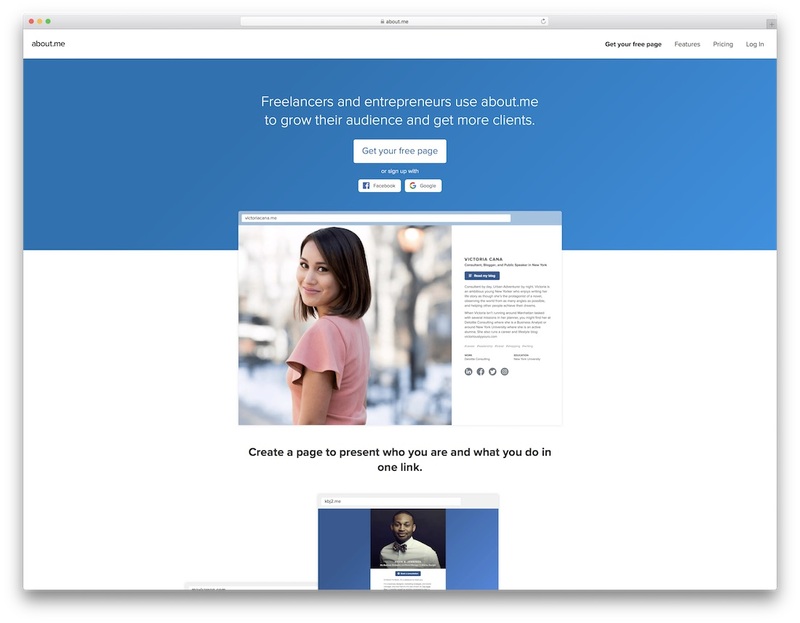 Since our templates are open source we would very much appreciate if you could create and share a responsive version of it. 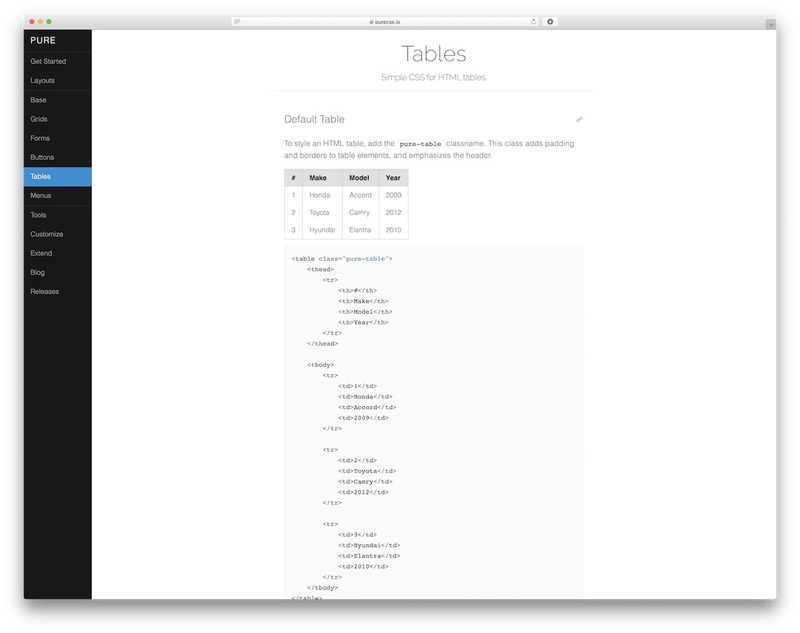 Very nice CSS table list! You solve my problem thank you so much!